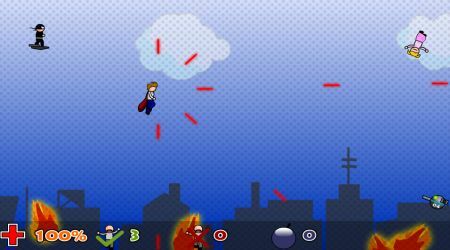 Use the WASD or arrow keys to fly around. Hit the Z or J key to shoot. Press the X or K key to defend. Use the C or L key to drop your super bomb. You can choose your hero\'s gender and difficulty level before the fight starts. Shoot at the falling rocks to get some power bonuses. Try to save as many falling civilians as you can.